Ricky Hatton is acknowledged as the best British welterweight boxer of all time and is perhaps most famous for his fight with Floyd Mayweather Junior in 2007. He has now retired. Who is Ricky Hatton, how old is he, when is his birthday, how tall is he, where is he from, what did his parents do, what is his background, is he English or Irish? Ricky ‘The Hitman’ Hatton was born in Stockport, Manchester in the UK on October 6, 1978 and grew up in the suburb of Hyde, east of Manchester. He is 39 years old and 1.7 metres tall. After he left school he worked in the family’s carpet business but his father quickly moved him out of carpet laying and into the sales area after he cut four of his fingers trying to lay a carpet. Why is Ricky Hatton famous and what is his occupation? Ricky Hatton was a welterweight boxer, perhaps most famous for his fight against Floyd Mayweather Jr in 2007. #hattonboxing #hattongym #rickyhitmanhatton #matrix #hattonclothing ? How much is Ricky Hatton’s net worth? According to the Express newspaper, Hatton has a net worth of around £31 million. How much does Ricky Hatton earn? According to Sports Interaction, Hatton’s average purse across his last nine fights was £2.5 million, which works out at a total of £22.5 million. He also earns an income from his work as a boxing promoter, his gym in Hyde and his own range of sporting equipment. How much does Ricky Hatton weigh? Ricky Hatton is well known for his fluctuating weight. As a fighter he weighed 147 pounds or 66kg, but between fights he often put on as much as 35 to 40 pounds (16 to 18kg). How much did Ricky Hatton get paid for fighting Floyd Mayweather Jr., when did they fight, who won? According to BoxRec.com, Hatton went into the fight with a guarantee of earning at least $6 million. Once the fighters received their percentage of ticket and pay-per-view sales, Mayweather Jr ended up with a total take of almost $25 million and Hatton $10 million. The fight took place on December 8, 2007 in Las Vegas. 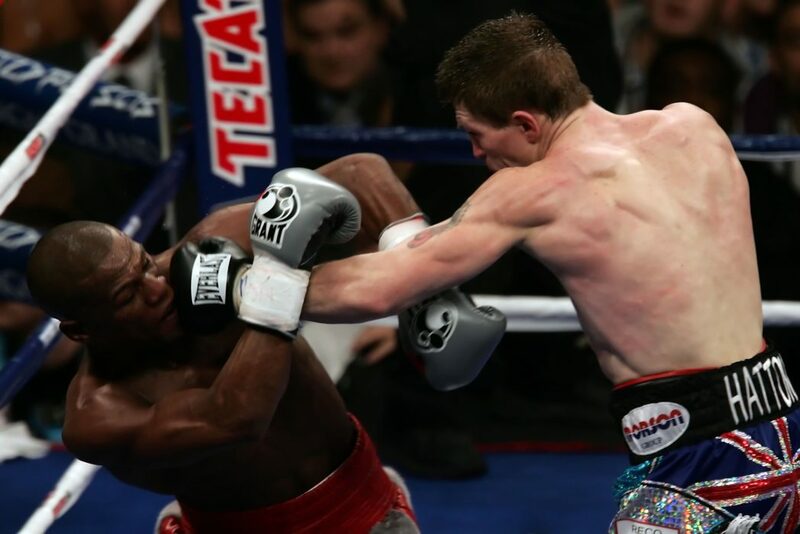 Mayweather Jr was awarded a win in round 10 soon after knocking Hatton to the floor. Team #weightwatchers HAVE IT! ??? Does Ricky Hatton live in Tenerife now, what does he do now, what happened to him? He has a holiday home in Tenerife but still spends most of his time in Hyde, near Manchester. The sportsman has had an ongoing battle with drugs, alcohol and severe depression including suicide attempts. He has often been in the media spotlight after behaving erratically or getting into fights on nights out. He is currently estranged from his parents. Has Ricky Hatton retired, is he broke? Ricky Hatton retired from fighting immediately after his loss to Vyacheslav Senchenko in 2012. He works as a boxing promoter and trains his son Campbell in his gym in Hyde, Greater Manchester. He is not broke, but as a result of his battle with drink, drugs and depression photos of him have appeared in the press where he looks dishevelled. Who the fook is that.?? Does Ricky Hatton have any children? Ricky Hatton has three children. He has a son, Campbell, who is training to be a boxer, with his ex-girlfriend Claire. He has two daughters Millie and Fearne with ex-fiancée Jennifer Dooley, and is close to all three children. Who has Ricky Hatton fought in boxing matches, how many fights has he won, what are his most famous fights? Ricky Hatton has 48 fights, with 45 wins and three losses. Hatton started off as a light-welterweight fighter and first won the WBU light-welterweight title in 2001, successfully defending this title 15 times. His first really big fight was against Australian Kostya Tsyzu in 2005 when he won the IBF light welterweight title. The press reported that the fight was the best British fight in 20 years, and Ring magazine declared him Fighter of the Year. He had another four wins before meeting Floyd Mayweather Jr. in 2007. Hatton appeared to be winning but in later rounds was penalised for appearing to hit Mayweather Jr. on the back of the head. Mayweather Jr. knocked him down in round 10 and the fight was declared for Mayweather Jr. shortly afterwards. In 2008 Hatton had wins against Lazcano and Malignaggi before being knocked out in the second round by Pacquiao in 2008. In his final fight in 2012 against Vyacheslav Senchenko he was knocked out in the ninth round and retired from boxing straight after the fight. Is Ricky Hatton married, who has he dated in the past, was he married? Hatton has never married. He was engaged to the mother of his two daughters, Jennifer Dooley, from 2005 until 2016 but their relationship broke down under the pressure of his drinking and rumours of infidelity. In 2005 he was reported to have had a year-long affair with Irish boxer Emma Bowe. Before Hatton met Jennifer, he had a brief relationship with the mother of his son Campbell, Claire.